It went live in Friday's patch. "For those of you inquiring about mission payouts, there was a change that reduces payouts by 50 per cent after a repeat of the mission," says Rockstar, after GTA Online players noticed a cut in their pay for repeat missions. "The first time you play and beat the mission, you will get the full amount. Subsequent replays will see a payout amount reduced by half. This is to keep the game balanced as well as encourage the exploration of new missions and content in the game." And then there was much rejoicing. Or not. "You're telling me that by wanting to do coop more often than competitive I'm doing something wrong," one support site commenter responded. Though the cash cut doesn't make repeat missions completely worthless, it does discourage them. You could end up spending more cash on armor and bullets to survive the mission than you earn completing it. New players may find it difficult to get help for old missions, as veteran players will have little reason to get involved. Also, although the cash penalty for death has been reduced, reducing the repeat mission payout effectively reduces the total amount of cash available; a benefit neatly balanced by what amounts to a penalty. 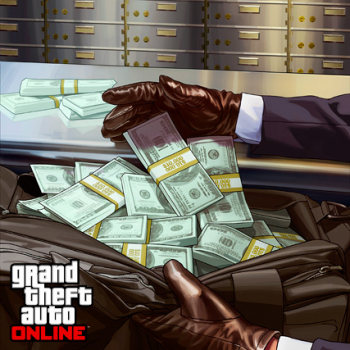 Rockstar argues that the payout cut is in there because players can get very good at a mission after several goes, making it easy to grind. However it didn't make the change public before the patch rolled out - "we apologize that there was not full clarity about this in the patch notes," it says - which only fuels fan rage over the changes. If servers start depopulating, Rockstar could find itself with an empty crime funpark on its hands. That'd be an embarrassing Christmas present for Rockstar.